Avoid spillage on skin when handling the repair liquid bottle. If droplets do leak out, rinse them off with plenty of water. The bottle has a limited service life which is indicated on its label. Depending on the vehicle, in the event of a puncture, use the kit located in the boot or underneath the luggage compartment carpet. 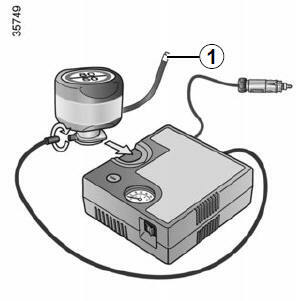 after a maximum of 15 minutes, stop inflating and read the pressure (on pressure gauge 5). 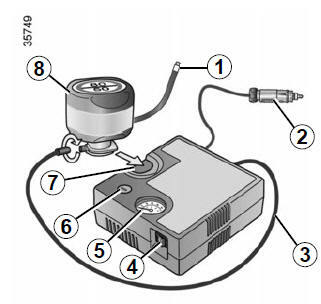 adjust the pressure: to increase it, continue inflation with the kit; to reduce it, press button 6. Once the tyre is correctly inflated, remove the kit: slowly unscrew the inflation adapter 1 to prevent any repair product from escaping and store the container in plastic packaging to prevent the product from escaping. At the end of this initial inflation operation, air will still escape from the tyre. You must drive a short distance in order to seal the hole. Start immediately and drive at between 12 and 40 mph (20 and 60 km/h) in order to distribute the product evenly in the tyre and, after driving for 2 miles (3 km), stop and check the pressure. If the pressure is greater than 1.3 bar but less than the recommended pressure (refer to the label affixed to the edge of the driver’s door), readjust it. 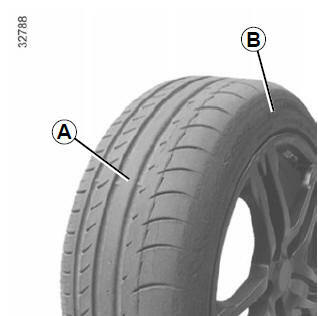 Otherwise, please contact an authorised dealer: the tyre cannot be repaired.